Debating the price of gas while the planet burns might seem like arguing about the placement of deck chairs on the Titanic. But it might be as good a frame as any to understand the policies and politics of this moment. With the arrival of a national price on carbon, Conservatives have decided that the future of climate policy in Canada will be decided at the nation's gas stations. Last weekend, a succession of Doug Ford's Progressive Conservatives in Ontario posted pictures of themselves solemnly pumping gas to draw attention to the 4.4 cents per litre that a federal carbon levy was expected to add to the market price of gasoline (oddly, none have so far posted photos of themselves applying for the federal rebate). Andrew Scheer got in on the meme and then flew to a parking lot in Upper Letang, N.B., to formally register his objections. Debating an increase of 4.4 cents in the price of gas while the planet burns might seem like arguing about the price of a drink on the Titanic. But it might be as good a frame as any to understand the policies and politics of this moment. Consider the case of a certain Alberta resident named Jason Kenney. In 2016, Kenney purchased a pickup truck, a blue Ram 1500. Since then, he's travelled almost 200,000 kilometres in that truck. But Kenney is concerned about the province's price on carbon — currently $30 per tonne — and its impact on enthusiastic drivers like him. According his own calculations, it would have cost him an additional $1,623 to drive those 200,000 km if that price on carbon had been in place over the last three years. Granted, Kenney earns a salary of $190,000, so $1,623 might not seem like a particularly heavy cost for him to bear. But it's an extra cost that still has to be justified. Standing in that parking lot in Upper Letang, Scheer reminded everyone that Prime Minister Justin Trudeau once said higher gas prices were sort of the point of carbon pricing. "The incentives that come from better choices, choices to become cleaner and greener, is exactly what we want," Trudeau said. "When you put a price on things you don't want, which is pollution, you encourage people to make better choices." Conservatives now point to that comment as some kind of gaffe. But if it's a gaffe, it's only according to Michael Kinsley's definition of a gaffe: a politician inadvertently speaking the truth. 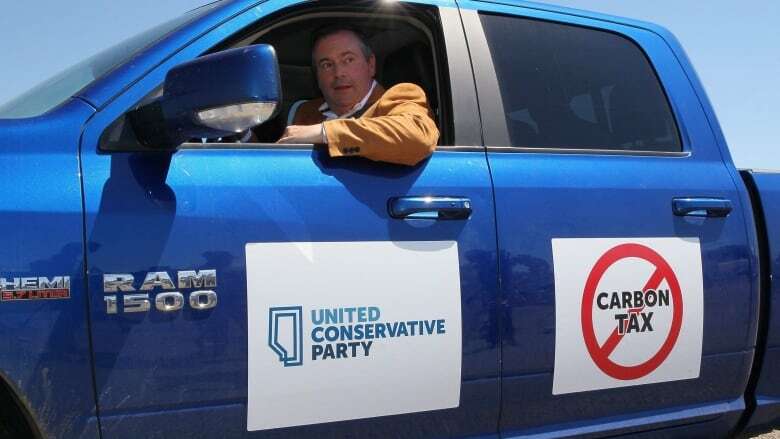 As an environmental policy, the extra cost could now convince Kenney to choose a more fuel-efficient vehicle next time. It could also push the Ram 1500's manufacturer, Chrysler, to produce more efficient models in future years. On a broader scale, the increased cost of individual transport could motivate citizens like Kenney to demand that their governments prioritize the building of public transportation. Regardless, the extra charge might at least lead Kenney to consider the costs associated with producing more of the emissions that drive climate change and global warming. The transportation sector is, after all, the second largest source of emissions in Canada. At its most basic, the extra cost imposed by carbon pricing is meant to correct a failure of the market. The negative consequences of producing carbon emissions are not priced into the cost of the gasoline burned by Jason Kenney's pickup truck. And so the provincial government has stepped in to ensure that the price at the pump better reflects that impact. Some years ago — actually, when Kenney was a cabinet minister in Ottawa — the federal government adopted a measure known as the "social cost" of carbon, a monetary estimate of the cost in damages associated with each tonne of emissions. After a reassessment in 2016, the social cost of carbon was set at $40.70 per tonne. By Kenney's math, he produced approximately 54 tonnes of greenhouse gas emissions (1,623 divided by 30). But according to the social cost of carbon, those 54 tonnes produced $2,197 in damages. By that math, Kenney shortchanged the planet by $574. Kenney, who happens to be the leader of the United Conservative Party in Alberta, is now vowing he'll repeal the carbon levy if he becomes premier. He says he would do some things to reduce greenhouse gas emissions — there would, for instance, still be a levy on large emitters. But Kenney is still promising to do less than the current NDP government. The New Democrats want to reduce the province's emissions by 50 megatonnes. Kenney's United Conservatives are promising to reduce emissions by 43 megatonnes. It's a similar situation in Ontario. Kathleen Wynne's former Liberal government pledged to reduce emissions by 37 per cent below 1990 levels by 2030. Doug Ford's new government is pledging reductions of 30 per cent below 2005 levels by 2030. The difference between those two targets is reportedly 37 megatonnes. In New Brunswick, where another new Progressive Conservative government is in place, the focus is also on hitting a less-ambitious target. Scheer's Conservatives are likely to take a similar approach federally. Since initially suggesting he would adhere to Canada's international climate commitments, Scheer has consistently avoided saying so. Indeed, if his allies in Ontario, Alberta and New Brunswick are committed to doing less, it will be impossible for Scheer to maintain Canada's current target for 2030. Public support for higher gas prices as the cost of fighting climate change is less than a sure thing. In 1979, Joe Clark's new government introduced a budget that proposed a significant increase in the federal tax on gas: from seven cents per gallon to 25 cents per gallon. The promoted goals were to reduce consumption and fund alternate energy sources as the government sought to make the country less reliant on foreign imports. Some of that revenue might have also gone towards reducing the budget deficit. Justin Trudeau will remember what happened next, because his father ended up being prime minister again: the budget was defeated in the House of Commons and Pierre Trudeau's Liberals romped to a resounding comeback. Of course, Clark's defeat can't be pinned entirely on the price of gas. And if the price of gas is lower this fall than it is now, the sting of Conservative attacks might be significantly reduced. But Trudeau must at least hope that his government's credibility is greater than Joe Clark's was, and that his justification for higher gas prices is stronger.